Article: HR practices: What are the points to keep in mind? 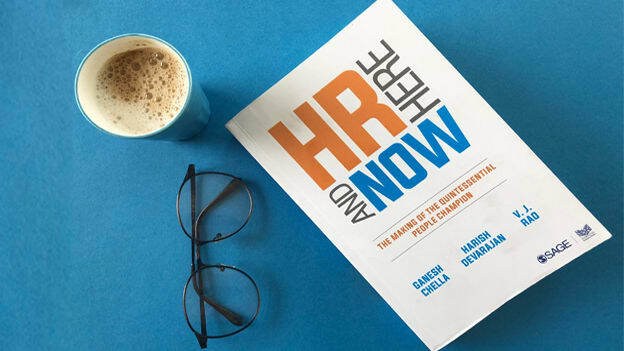 HR Here and Now, not only makes for an engaging read but it's also a thought-provoking analysis on the human resources function and HRM. It has been co-authored by three HR veterans, Ganesh Chella, Harish Devarajan, and VJ Rao, who have contributed tremendously to the HR community. The book evokes a very relevant question — "Does the HR function need ‘redefinition’ in today’s age and context?" From analyzing the industrial perceptions about the HR function to "defending" the importance and relevance of the function in organizations, the authors give their expert insights on how to address the issues affecting the HR. The book acknowledges and investigates the HR processes in context of the employee lifecycle - from hiring, managing careers, learning, leadership, to performance management and offers a context of the new demands from each of these processes while providing a storehouse of perspectives on tackling the diverse issues of Talent Management at every stage of the employee lifecycle. Every chapter has in-depth case studies from contributing organizations like Accel, ABG, Airtel, Amazon, TACO, Asian Paints, Borneo, TVS, CCD, Rivigo among others. The book’s exploration of the diversity of topics, the applicability of the perspectives offered, and the courage to take on some of the most complex talent challenges of today's times is commendable. This book has something for everyone who wants to learn about the HR function. While the authors define the target reader for the book as young HR professionals, I feel that the book caters to HR professionals across all levels and even business leaders who are interested in gaining an overview of HR. Here the young managers will get an excellent overview of the HR function in today’s context (while they may not relate to all examples); mid-level professionals can go straight to the case studies for guidance, and Senior leaders will find invaluable perspectives built on some of the critical dilemmas. Business owners and CEOs of startups will also enjoy the appeal of this book and can use the useful information in it to cultivate their talent strategy. This is a book full of perspectives built from experiences — this combination can never go wrong. A highly recommended reading.